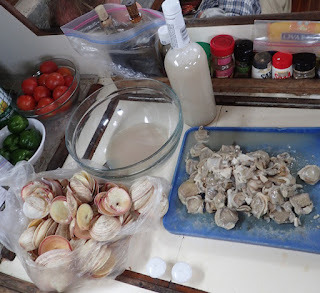 Galley Wench Tales: Shellfish Bonanza! Now What? soaking them in salt water and ½ c cornmeal overnight. Saturday mornings are the “big” albeit short day in Tonga’s Neiafu’s produce market. Instead of closing at 4 pm, Saturdays the market closes at noon. Sunday it’s closed altogether, along with nearly all businesses, by law. Unlike weekdays, locals bustled through the market and swarmed the streets, both buying and selling a variety of stuff, much like at a flea market. Electronics. Clothes. More handicrafts – baskets, jewelry, tapa mats, carvings. Fruits, veggies and coconuts off the sidewalk in front of their homes. It was almost like a carnival; I kept expecting to see a parade, singing or dancing. their overnight soak, and to get the cornmeal off of them. Maybe that’s why I saw shellfish. 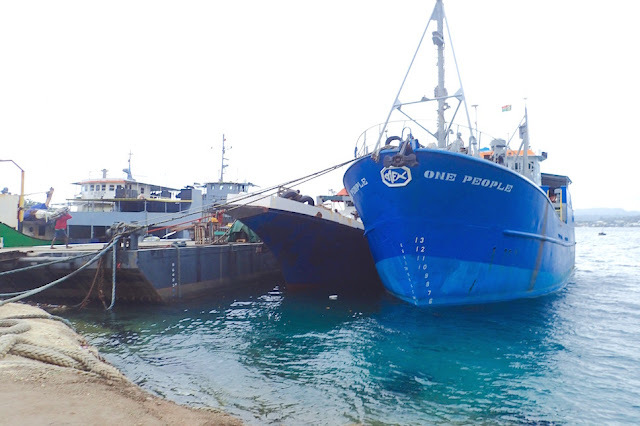 There was a fish market nearby; we found it by accident when checking into customs. But this was the first time I saw shellfish at Neiafu’s produce and handicrafts market. “How much?” I asked, pointing to a bag of clams. There were several roughly equally sized bags in front of the girl, her back leaned against the market’s exterior wall, flanked by small stands with vendors selling soursop, and coconuts in coolers, for drinking. “Ten pa’anga*,” she replied. *$10 pa’ainga = ~$5 USD. 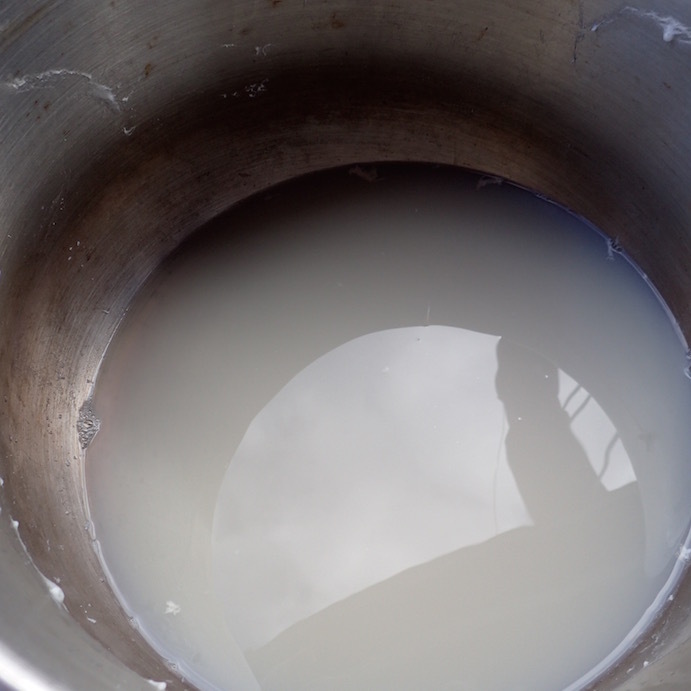 Clam soaking water, opaque with clam spit. In shell, one bag looked close to a gallon container in volume. And the clamshells looked very clean. That struck me as a good deal. The timing was right as I was shopping for provisions for the next week or so in the out islands, and I knew we were light on protein. “I’ll take them,” I said, handing her a $20, as I didn’t have change. Nor did she, at the time. I asked if she could hold them until I finished my shopping, as I knew they’d be heavy, and provide change when I returned. Chalk up more points for the honesty of Tongans. Not only did I nearly forget to swing back and pick the clams up, I forgot my change. She didn’t, and proffered a $10 as soon as she saw me approach. It had been a long while since I cooked shellfish – not since harvesting conch in the Bahamas, last cruising season. I knew Wayne would enjoy a white chowder, so I picked up the remaining ingredients to supplement my stock… fatty bacon, onions, potatoes, bell pepper… milk, butter, garlic, herbs a plenty, vermouth, and celery, were already aboard. As a favor to Wayne, I omitted the carrots. 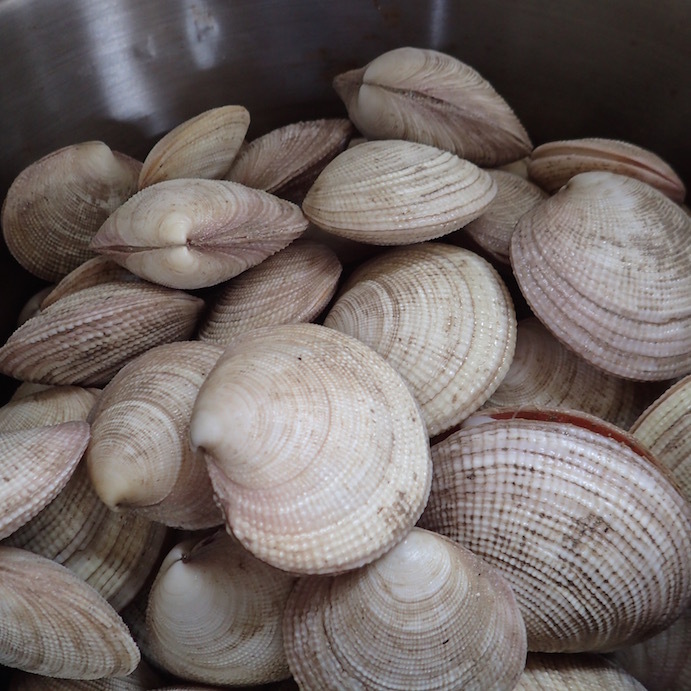 Clams open naturally when steamed. These are beauties, aren’t they? I had no idea how to cook the clams, though. All the clam chowder I made (not counting conch in the Bahamas) I used canned, chopped clams. “Barry,” I asked when we arrived at Hunga Haven, lovely lagoon about 9 miles sail from Neiafu, “Are these clams I bought at Nieafu’s market safe to eat?” Barry is one of the VHF cruiser’s net controllers, and hosts a mooring and wifi in Hunga’s lagoon. After asking me how they looked (good, clean) and how they smelled (fresh, not at all stinky), his guess was they were fine. “Dump them in water overnight,” Barry advised. “They will spit out whatever was in their system, getting rid of the grit before you cook them,” he advised. He thought if I could spare it was best to soak them in fresh water. Given my paranoia about leaving seafood unattended, I quickly dumped them in fresh water in my 7 quart pressure cooker, the only pot I had big enough to hold them. Later that eve, I found Mike Greenwald’s of “The Cruising Chef” advice…. Soak them in sea water overnight with ½ cup of cornmeal. Alas, they were already in fresh water, but I added the cornmeal. of 3-4 12-oz cans of clams, but much better quality! 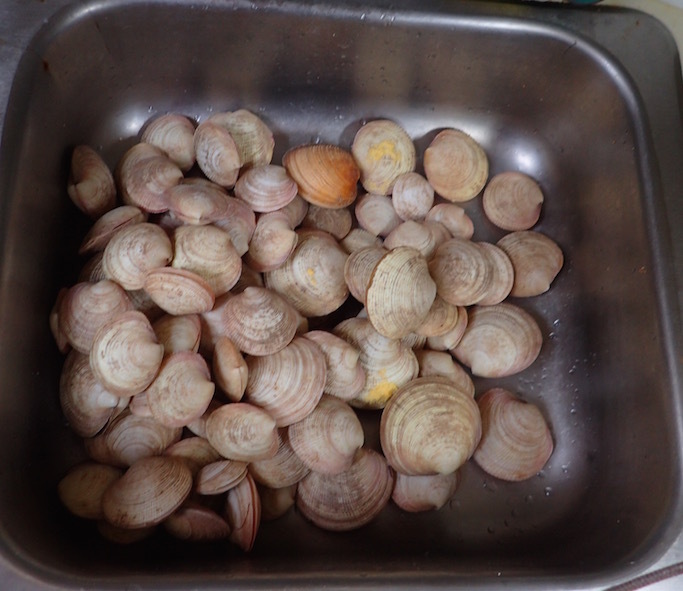 First thing the next morning, I dumped the clams in the galley sink to drain. The water I soaked them in was milky, so I assumed the soaking successfully prompted clam grit spitting. I rinsed them, checking to make sure none were open without closing if nudged (again, found Mike Greenwald’s of “The Cruising Chef” advice). 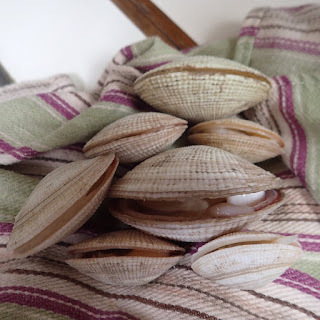 Out of the 72 clams, only seven seemed stuck open. I chucked them over the side for crab food. Then, just to be extra sure, one by one, I dropped each of the 65 remaining clams into a glass of water for a final rinse and to make sure they didn’t float. Floaters, again according to Greenwald, are inedible. Back into the rinsed pressure cooker filled with an inch or so of water, I steamed the clams for 10 minutes, so each would cook and open. 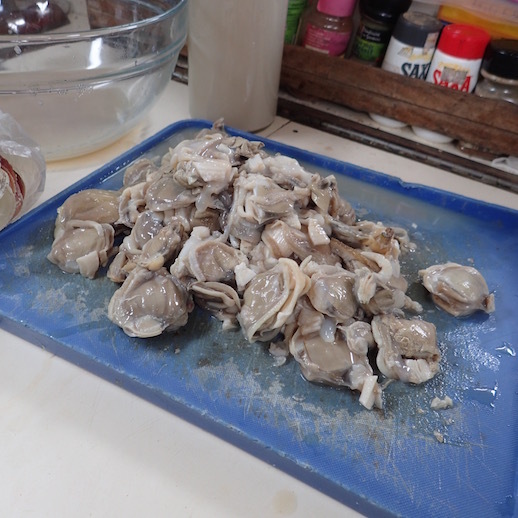 Then I shucked them, reserving their liquid for the chowder stock, and set them aside for chowder-making later. Well, except for snitching a few to make sure they were grit-free (they were) and to be the guinea pig in case there was any issue with them (there wasn’t). They were delicious! for chowder making later that day. Later on, I cooked the fatty bacon in my pressure cooker pot, as it was the largest pot aboard. Then chopped onions, diced potatoes, chopped garlic, diced bell pepper, reconstituted chopped celery cooked in the bacon fat. In went black pepper, sage and thyme, the herbs used in McCormick and Schmick’s chowder recipe. Once the onions were transparent and the other veggies were nicely soaking up their flavor, I threw in a little vermouth (as I had no dry white wine) and let that soak in, too. Then I added in the clam juice and milk reconstituted thickly from the full cream powder. As the stock got hot, figured it was time to add the clams, several slices of the cooked bacon, and start tasting, and adjusting the seasonings as needed. I added more vermouth, a dash of Spike seasoning, more milk cream powder, whisked in, and about a tablespoon of butter. We enjoyed a chowder feast with Steve and Patty of Armagh. Not only was it tasty, it was the least gritty chowder I’ve ever eaten. My one “oops”? 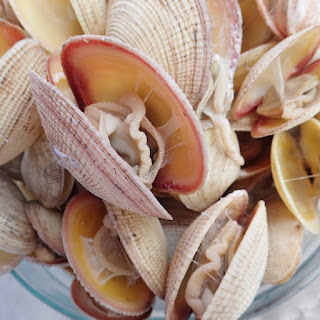 Trim all extraneous parts from them the clams and chop them, especially the bigger ones. Wayne did that with the leftovers, as did Barry, with my chowdery thank-you for his advice. “We were thinking of you, while we ate a delicious chowder, and you were hiking in the rain,” Barry said, smiling as he handed me back a sparkling clean container. Would I get clams again, given the opportunity? 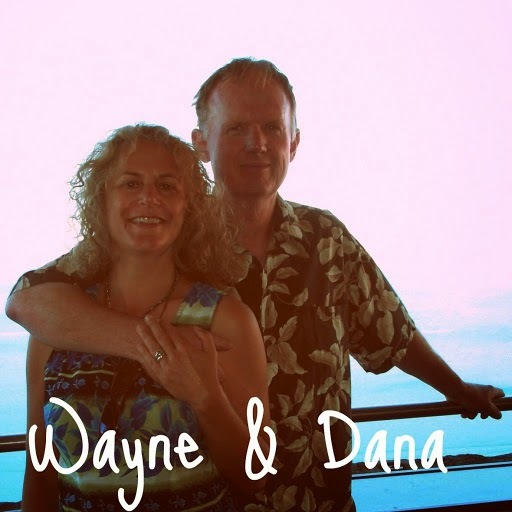 Much less work for me (Wayne mans the BBQ – not me – double bonus), so yeah, why not? Though I would happily make chowder again, too. 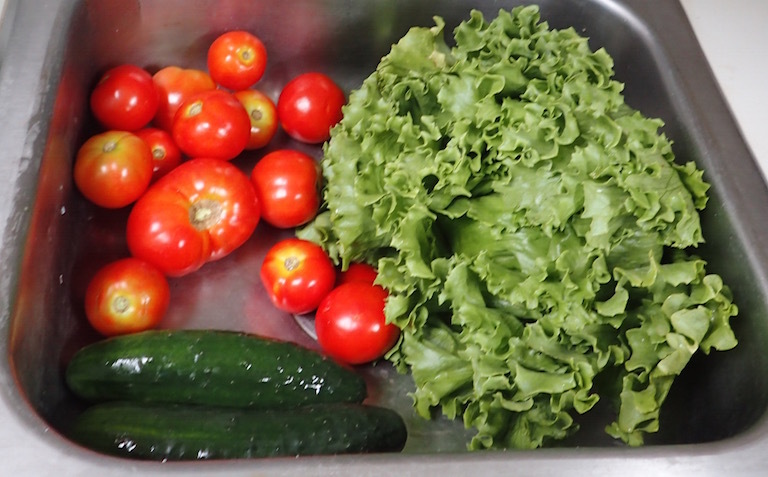 $5.50 USD for produce in Neiafu. A bargain & good stuff!